Every once in awhile, a movie comes along that audiences just can’t seem to agree on. This happens more often than not when it comes to the horror genre. Horror fans have certain expectations for their beloved films and as long as the movie hits those points, most of those fans will wind up loving the movie, even if the general public feels that the movie in question was less than spectacular. This split is very evident when it comes to one of the most important horror films of all time: The Blair Witch Project. The basic premise behind the film is that three documentary filmmakers are researching the legend of the Blair Witch, a spirit that is said to inhabit the woods surrounding the small town of Burkittsville, Maryland. They hear the warnings and record the stories, yet they still decide to journey into the woods to uncover the truth for themselves and were never heard from again. Five years later, the footage that was left behind is uncovered and the audience is exposed to the reality of the disappearances. Horror fans have seen similar plots almost since the inception of the genre, so there was nothing really spectacular about the story itself. It was in the execution, however, where BWP separated itself from the herd. At the time of its 1999 release, the “found footage” tactic that BWP employed was not a new idea. Going back to 1980, Cannibal Holocaust may have been the first movie to use the same tactic and horror movies sporadically used the style for the next two decades. However, it was still a style that the general public was unfamiliar with. BWP changed that forever. Before the launch of the movie, the makers behind the film decided to play the “found footage” aspect in a way that no one else had ever considered and as a result, they changed the horror genre forever. To begin with, the actors (Heather Donahue, Michael C. Williams and Joshua Leonard) weren’t presented with a script during the eight day shoot. The filmmakers (Eduardo Sanchez and Daniel Myrick) wanted to present their audience with the most authentic footage possible. Accordingly, rather than presenting the cast with a script, they were presented with coordinates that they had to use GPS systems to locate. Once located, the actors would find crates that contained clues as to their actions for the day. This ensured that the reactions and dialogue expressed by the cast would be as genuine as possible and that audiences would be drawn in by what seemed to be authentic footage. In another attempt to replicate authenticity, the people that are interviewed by the trio for their film aren’t all actors. In fact, most of them were not actors or real residents of Burkittsville, and the cast had no idea who was real and who was simply reading a script. Again, this allowed the actors to express genuine emotion and real reactions to their subjects’ stories, adding to the realistic feel of the movie. Once the movie had wrapped production, the next step was promotion, and this was another area where the innovative filmmakers made their mark. Rather than just leaving old fashioned Hollywood marketing to promote the film, the filmmakers wanted to make sure that their audience believed what they were witnessing on screen. In order to pull off this feat, the disappearances of the documentary filmmakers were treated as real disappearances rather than a plot of a movie. 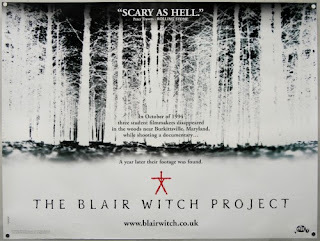 The most brilliant step in this process was the release of the “documentary”, Curse of the Blair Witch. This film was presented as a real documentary (though, it originally aired on the Sci-Fi Network) and explored the disappearances of Heather, Josh and Mike rather than focusing on the film itself. Using old news reels, eyewitness testimony, and some of the found footage, Curse of the Blair Witch brought a creature to life that moviegoers already feared even before they purchased their ticket to the movie. Their promotion of the film worked, presumably even better than they ever could have imagined. As a result of the very successful promotion and production of the movie, as audiences lined up for the film, many viewers absolutely fell for the prank. Some audience members believed that what they were watching was, in essence, the equivalent of a snuff film. However, was it good? Many would argue but the answer is a resounding “YES”. Between the improvised acting that is pulled off effortlessly by the cast and the genuine scares that the movie delivers, BWP is a movie that everyone should watch. The complaints about the film ranged from the shaky camera of the unknown shooting style (many theaters actually posted warnings urging those who are prone to motion sickness to stay away), the tempo of the film and to the lack of any real visual protagonist. The people who hold these beliefs, however, obviously missed something in the film’s brilliance. The tempo intentionally builds as the movie nears its close and what some viewers may have considered “slow” was nothing more than the filmmakers’ choice to let the fear build throughout the film and for the audience to gradually become as uncomfortable as the characters they were observing on screen. While the movie did lack a visual protagonist, one of the most primitive fears that we each have is the fear of the unknown and that is exactly what the characters and the audience were exposed to as the characters continued to be terrorized. The scene where the group is in the tent and is awakened by the laughter of children, only to have the tent attacked moments later by forces unseen is one of the scariest moments that Hollywood has offered horror fans in many years. The movie itself does for the woods what Jaws did for the beach. There are few viewers of the movie that aren’t reminded of its horrific tales whenever the idea of camping is brought up. The movie moved along a very natural progression and it seemed that audiences were truly watching three days of the filmmakers lives in which they were completely lost, exhausted and confused before being terrorized by unseen forces. In other words, the movie was successful on all fronts. In addition to being a brilliant movie, The Blair Witch Project changed the genre forever by becoming a blockbuster movie on a shoestring budget and introducing the world to a new way to experience scares. Since its release, the found footage format has gone almost mainstream when it comes to horror movies and has even leaked across to different genres. Only some of these movies have been able to capture the fear that BWP projected and when a movie is done well, it can thank BWP for paving the way.